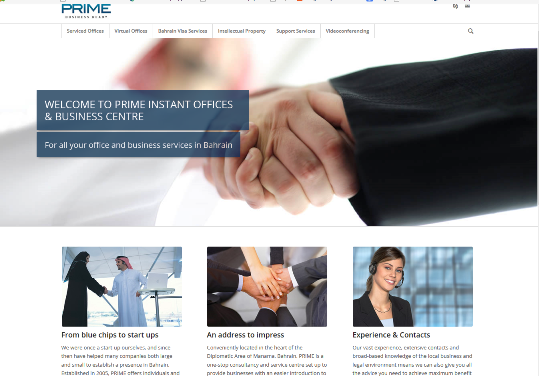 PRIME Instant Offices and Business Centre is located in Manama, Bahrain. Their clients range from multi-national businesses looking to open an office in Bahrain through to start-ups and individual professionals wanting to visit or do business in Bahrain. The company offers a wide variety of services, including office space, virtual offices, business support, IP protection and visa assistance. They’re looking to sell these different services to clients of many kinds across markets as diverse as the US, UK, EU and the Middle East, which is challenging in itself. PRIME had previously used an SEO company with little success, and had also had a poor experience with another copywriter. It was essential that they found the right long-term approach with a writer and marketing consultant that they could trust. I’ve been working with PRIME since 2009 – over five years to date. For the most part this has involved writing all of their website copy and advising on SEO, but also helping to develop and sell new services, both online and in print. With the website, the first step was keyword research. With all their different services, varied target audiences, global reach and a finite budget, it had to be accurate and well thought-out. I also researched Bahrain itself, and what doing business there successfully involves. I then wrote the whole website, advising on the numbers and types of pages, as well as the content. I additionally wrote the tags and offered SEO guidance – simple steps the client could do themselves at little or no cost. Since then, I’ve continued to work for PRIME. This has involved writing brochures and other printed materials, as well as continuing to work on the website. The latter includes adding new services, plus re-adjusting existing current to reflect changes in what Google were looking for, and to meet potential clients’ needs. The results have been excellent from the beginning, with many relevant and searched-for terms on the first page of Google after just a few months. Overall traffic grew steadily as well, along with enquiries and subsequent new customers. Regular checking meant that in 2014 I was able to highlight a major design issue by a third party. which had led to a sudden major loss of traffic. I was able to identify the solution, and the website was soon back on track. To see work I’ve done for other clients outside the UK, please go to my English Copywriter page.